I came across the Type Tarot on gamecrafter.com. It is a self-published print-on-demand tarot deck created by Hurgle Studios. Wordsmiths and English Lit majors are going to go nuts for this cute novelty deck! It’s adorable! As soon as I saw it, I knew I had to have it. If you thrive on words and writing, I know you’re going to gush a little over the Type Tarot. It’s inevitable. As a workable tarot deck, though, I think that’s about where Type Tarot ends: as an incredibly fun, kitschy novelty deck for your collection. Most of the design and layout is minimalist and handsome, with what I’ll call (but leave undefined) a hipstery aesthetic. Except… to print “TYPE TAROT” on the card backs was… ack! Why?! The box was too big for the deck. I’m starting to wonder if this is an issue from Gamecrafter’s end. I have bought two other decks from Gamecrafter before. For one, again, the box was too big for the deck. For the other, the velveteen drawstring bag was too small for the deck. Here again, there is a size mismatch with the packaging. The little white booklet (little black booklet? anyway, I’ll still call it LWB) is really lovely as well. According to the LWB and the product description for Type Tarot at Gamecrafter, this deck is targeted at tarot beginners. I adore this novelty deck, but a beginner’s tarot deck it is not. Again, I think this is a production issue from Gamecrafter that the creators of these decks have no control over, the deck comes out of order. The Majors are colored, and at first I thought maybe they would be color-coded by elements or something, but I’m not sure of the rationale behind the color choices. I couldn’t figure it out. The Minors are on white cardstock. 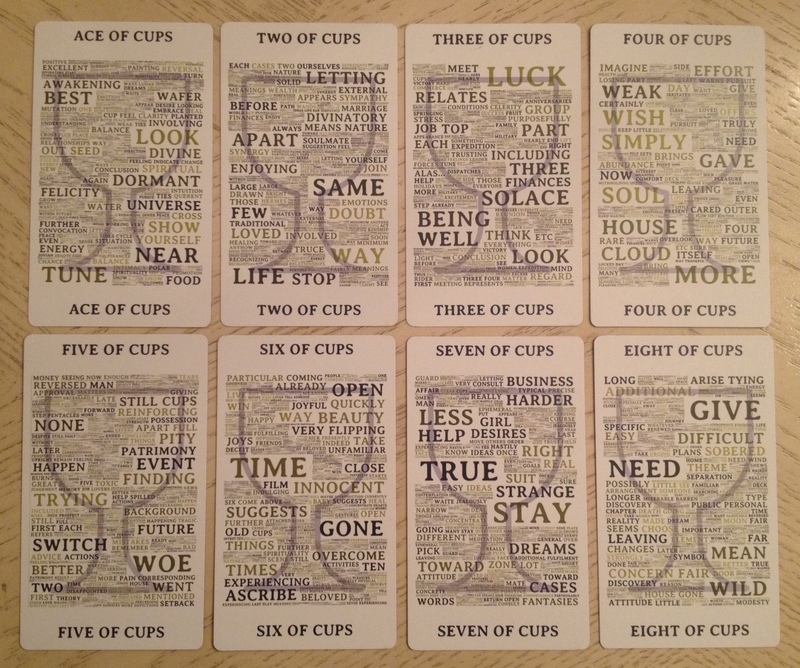 The premise for the deck is each card contains an artistic arrangement of keywords for the corresponding card. I am assuming the artistic arrangement is automatically generated because you’ll get some odd choices of words in larger font size than the other key words, e.g., the word “also” appearing quite large in a few of the cards. 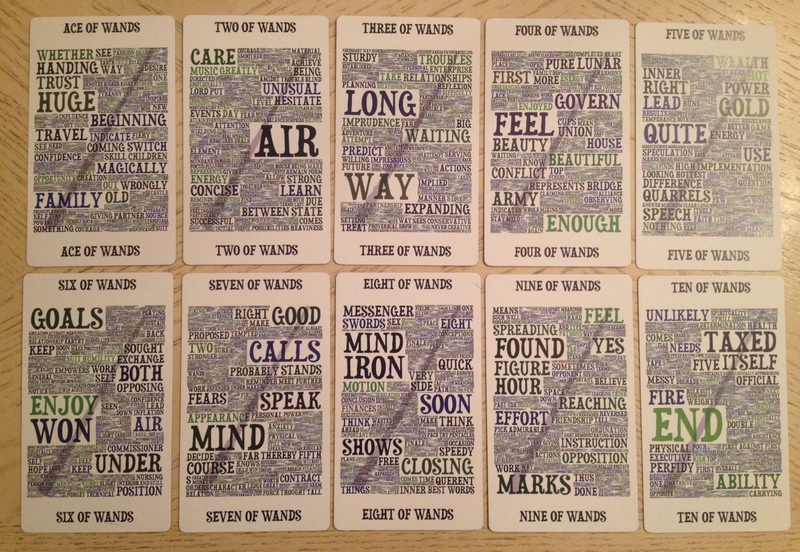 The keywords on each card with the deck targeted at beginners learning tarot for the first time concerns me a bit. I think at best, using this deck as maybe flashcards for a supplemental learning tool to your tarot deck would be good, but as a beginner’s deck? I wouldn’t recommend it. Some of the large size keywords on these cards are disconcerting to me, but I also believe in the infinite ways we can interpret a card, so here for me it’s not a judgment of right or wrong keywords. I just think that it’s one interpretation of the cards, which is provocative to an intermediate or seasoned tarot practitioner. My fear is that rather than be liberating, these cards could be limiting to a beginner, as a beginner comes to rely on just these words exclusively, and not learn tarot as an intuitive divinatory system. Now, these cards are still an incredible divination tool, as I will get to, though I may use it in a slightly different way from how I would typically approach a tarot reading. 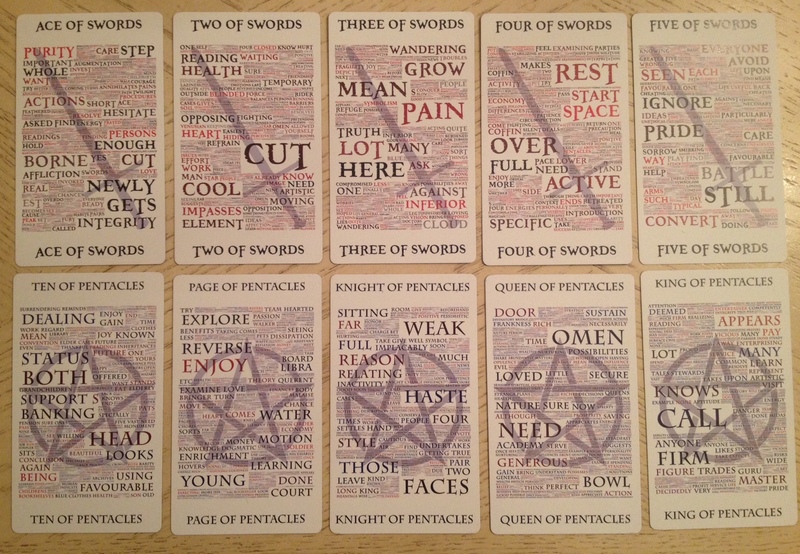 I got tired of taking snapshots of all the cards and after the Wands and Cups, felt like if you’ve seen one, you’ve seen them all, so above for the Swords and Pentacles, there are only five cards from each suit. Sort of kind of (but not really) like bibliomancy, how I’d use this deck for divination is to draw cards at random and drop my finger down onto certain keywords, or note which keywords on each card jump out at me. Those keywords that I’ve pulled out would then be the divinatory result, and I’d interpret the significance of those keywords to the situation at hand. The cards are really beautiful in terms of graphic design and are so modern and hip. I love that Devil card. It looks like something you’d put inside a cream-colored mat border and then in a thin black or silver frame, and hang it in your ultra-hip, ultra-contemporary posh-minimalist living room. I forgot to mention how cool the silhouette of each suit symbol is in the background of each Minor card. 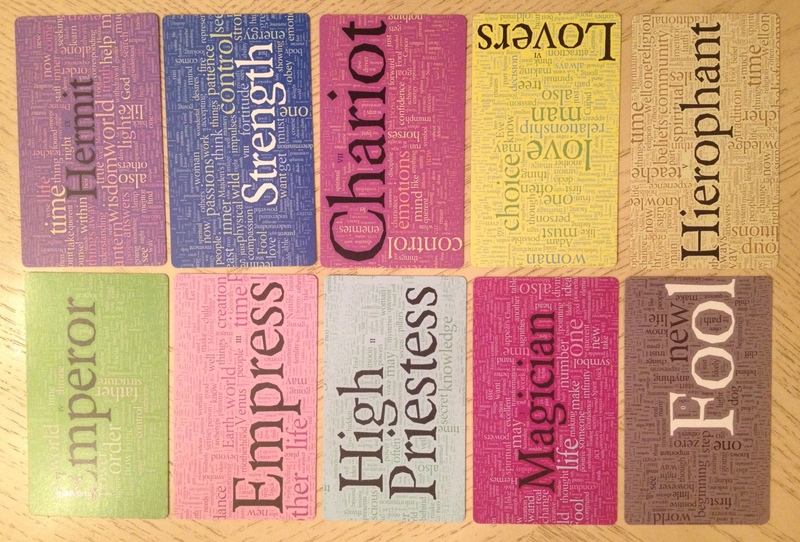 The whole layout of each card makes Type Tarot perfect for that bibliomancy-ish form of divination I was talking about. I confess I don’t completely follow some of the keyword choices or the choice for certain words to be much larger than the others, but I do love the concept. Again, great, great novelty deck. It’s a very cool concept. Overall, the Type Tarot is a fun deck that I’m glad to add to my collection. Everything considered, it was a bit overpriced, but that comes with the territory of buying self-published tarot decks. I agree with your thoughts about the deck. It looks intriguing, but is probably not something I’d consistently use in readings for other people. I don’t think I’d use them at all in readings for other people. This was, for me, 100% for collecting purposes. The novelty got to me and just all of it dazzled at someone who loves words and tarot, so it makes sense that I’d get lured in. Gotta tell you though, I bought the deck several months ago and after sifting through the cards to take photos to write up this review, those cards have been sitting in a drawstring bag collecting dust in a giant stack of other decks on a bookshelf…………. A really fun, innovative idea for a tarot deck though!! Lots of bonus points for the idea!! As a former typesetter, I was interested and fascinated by this deck. But on second consideration I don’t think it’s for me. I gravitate and respond to illustrations, visuals, and images that provoke a reading to keywords that may get in the way of intuitions. Also not digging the back side of the cards with the deck title on it. Too many words, as Salieri would say. I am digging, however, your Web site’s re-design and look. Real cool, elegant, stylish, and to the point. Two thumbs up! Great review of an interesting concept. As a collector, I’m drawn to it as well… but it doesn’t seem like it would be that functional for readings. Maybe as an addendum to a card of the day or meditation tool, setting it up as a reminder somewhere. Just as a heads-up, and maybe what the deck creators were inspired by, you can create your own word cloud on the internet – it comes out looking just like this, and the app itself chooses which words are bigger or smaller. Google word cloud and play, then save! Bell, I always love your reviews. Your observations and reactions are meaningful to me and almost always match my feelings for a particular deck… Simpatico! And I love love love your new whatchamacallit design thingy with the chop at the top of your blog! Bravo! Wordle.net is the one I’ve used most often to create word clouds as seen in the Type Tarot.